Unique Moments Photography of Gig Harbor Washington is all about Unique Images, Fun, Creativity, and making sure clients have their stories told the way they want them told. 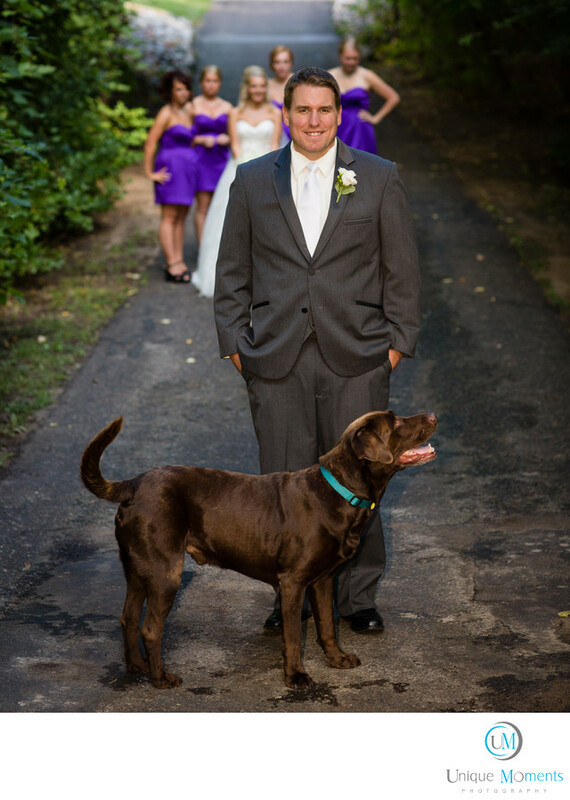 So We never got excited when we saw our groom heading out for his first look with the family pet. We do have a somewhat Firm rule that First Looks are for the bride and groom only. However, we bent it for this first look because the only word Champ knew how to say was woof. It was a lot fun to create the image and I was a little concerned that Champ might jump up and get the brides beautiful white dress dirty. But Champ was a trooper. He just laid down and took a time out while the couple had their first look. We see pets included in the wedding plans from time to time and the images are always cute. Champ made it to the album. It was a fun day for everyone at this wedding. Location: 3510 Grandview Street Gig Harbor, WA 98335.